Summary: Dex is a seventeen year-old disillusioned by life. With a step-brother who died of a heroin overdose, a father paralyzed by a botched suicide attempt, a mother who favours his step-father over him and a girlfriend who was abused as a child, Dex numbs his pain with liberal doses of the marijuana his father decided to grow. As the lines between reality and fantasy blur considerably, Dex’s filmmaker’s eye frames the story of his life as he sees fit, but eventually he reaches a point where even he can’t tell the difference anymore. 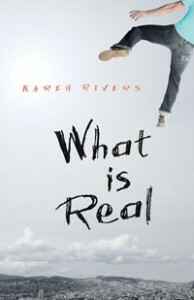 Review: If I were still in high school and I was tested on the plot of What is Real by Karen Rivers, I’m not confident I would pass. This is because Dex, the narrator, is unreliable at best, and at worst his perspective is much addled by his drug use. While a sympathetic character initially because of the sheer number of terrible events that have happened to him and his loved ones, Dex’s perspective is challenging to follow, and the reader can never be sure what is fact and what is fiction. I may not have liked Dex, but Rivers deserves respect. Her whole novel is about a young man severely affected by grief on many fronts, and she skillfully allows her reader to experience the same confusion and altered state Dex does when he uses marijuana. Reality becomes a fluid concept for Dex, and for the reader by association. I can only imagine the type of research Rivers must have had to do to write so well as to make me feel like I was smoking along with Dex. Assuming Dex’s characterization of her was accurate, my favourite character is Tanis. I’m not pleased Dex seemed to be attracted to her because of her perceived ‘brokeness,’ yet she is fascinating, smart and loyal to a fault. Also, I just loved the way her mind works. I feel like I was watching Dex’s story unfold through a fog. I know generally what happened, but the specifics are blurry. After everything that had happened to him and to Tanis, I could see why Dex and his friends wanted to find a way to take control of their lives again except I didn’t quite understand how what they did brought that about. Or the part about Olivia. Or the mysteriously healing knee. Or numerous other aspects of the book, like Dex’s little sister. What it comes down to is that What is Real is a hard to follow, mind-bending story without clear answers. By the end it is uncertain which parts of the tale really happened, but there is hope for the future as Dex seems willing to fight his addiction at last. “His legs are new. His lungs are new. He’s alive. Or at least not dead. “When you start to lie, it’s easy to lose track of what is what. Sometimes it’s impossible to know when you start. You think it’s just that one wall, with the door and the tunnel and then suddenly it’s a whole house, a whole city of tunnels and lies and none of it matters. You can’t keep tack because it’s not trackable. The tunnels don’t lead anywhere that you remember because you are busy remembering the lie. I think I started when I was five, riding my bike down the street, a book taped to the handlebars.